The actor, the monkey and the 3D war of words | What Hi-Fi? Can a letter of apology head off a legal battle over 3D technology between two of the world's leading TV companies? Just in case you thought the stakes weren't already high enough in the battle between rival 3D technologies – after all, a major theme of Panasonic's recent European event in Japan was the superiority of its active shutter system over other 3D offerings – it seems things have been getting very heated in Korea, with a war of words, and adverts, between the world's two TV market leaders. For the past month or so LG and Samsung have been trading blows, in a consumer-confusing war of attrition only now (hopefully) resolved with a letter of apology from a senior Samsung exec to LG display's engineers. It all started with an LG advert promoting its new Film-Patterned Retarder passive-glasses Infinia Cinema 3D technology. It showed a clean-cut model lying down to enjoy his TV, and reaching out to touch a racing-car conjured up by the 3D tech. It was all to do with LG's claims that the passive system is flicker-free and easier to watch, and suggested that 'Finally, you'll have a comfortable way to watch 3D'. A senior Samsung executive, Executive Vice President Kim Hyeon-seok, hit back at a media briefing, pointing out there's no 3D system able to work when lying down on your side like this. LG responded with a statement saying that 'Heads should be fixed horizontally and viewers should sit up straight to view (3-D images) through the shutter-glasses type TVs, but the technology has evolved and it can be viewed at any angle through the FPR method. LG apparently came back by saying that abusing a competitor in this way only showed that 'Samsung has lost it.' It also sent a letter to Samsung asking to confirm the media reports about Kim's remarks, and suggesting it may take legal action against him for defamatory remarks about its engineers. Sources suggest the company wasn't too concerned about the remarks, but the engineers themselves were angry, and demanded action. “Our engineers pride themselves as global experts on displays but the insult hurt them,” the company said, adding that, if the company hadn’t taken any action regarding the insult, the engineers would have lost trust in the firm they work for. “This was the least we could do,” he said. Then came the Monkey Ad, which turned up the row to boiling point. Samsung produced a print ad featuring leading Korean actor Hyun Bin, sharply attired in a suit and active glasses, enjoying his Samsung 3D LCD TV. Oh, and a little monkey down in the bottom right corner wearing old-fashioned red and blue anaglyph 3D glasses. Next to the monkey is the woeful lament, 'Why isn't my 3D TV fully high-definition?'. 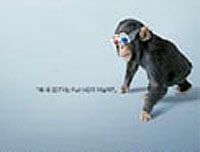 Seems this didn't go down too well with LG Electronics CEO Koo Bon-joon, who assumed the daft monkey in the retro glasses was meant to symbolise his company. Lawyers sat up and took notice: this one looked like it could get big and expensive if it went to court. But now it seems there may be a solution: reports in the Korean press suggest Samsung's Kim has sent a letter to Lee Bang-soo, head of the management support centre at LG Display, in which he apparently apologises for his remarks. LG is playing it cool: it says it's received a letter, but it hasn't opened it yet, as Lee is away on a business trip; it'll get round to having a look today, when he returns, and 'We will decide what to do after consulting our engineers'. So, the matter is now in the hands of the people with pens in their top pockets, who must decide how affronted they still feel, and whether whatever's in the letter helps salve their wounded pride. At best, the apology will put an end to the whole unseemly mess; at worst, it may provide the lawyers with more evidence for a defamation suit. But whatever happens, the loser – as in all format wars – will be the consumer, who will remain as confused as ever which way to jump when it comes to investing in 3D technology.